After phase two of the report reviewing Michigan State University's Title IX program was released, Interim President John Engler announced his plan today to create a new entity: the Office of Civil Rights and Title IX Education and Compliance. The office's responsibilities will include overseeing the Office of Institutional Equity and the Title IX Prevention, Outreach and Education Office. Essentially, the office will coordinate efforts and programs which provide crucial services to survivors of sexual assault and relationship violence, as well as oversee preventative measures. ASMSU President Lorenzo Santavicca took to Twitter this evening to share the announcement of the creation of the Office of Civil Rights and Title IX Education and Compliance, praising it as a "step in the right direction." After numerous on-campus protests and rallies for better treatment of sexual assault survivors have been held by MSU students, including one during the week of Larry Nassar's trial in January and another just this evening, Engler has finally responded with action rather than words. Students are anxious to see what changes the new executive office will bring. "I think this is definitely a good start and I like that they have 12 new positions within that office," said Zahra Mukhtar, a senior at MSU. "I just hope they hire more counselors or psychologists because people who have encountered that type of abuse really need professionals to guide them to healing." 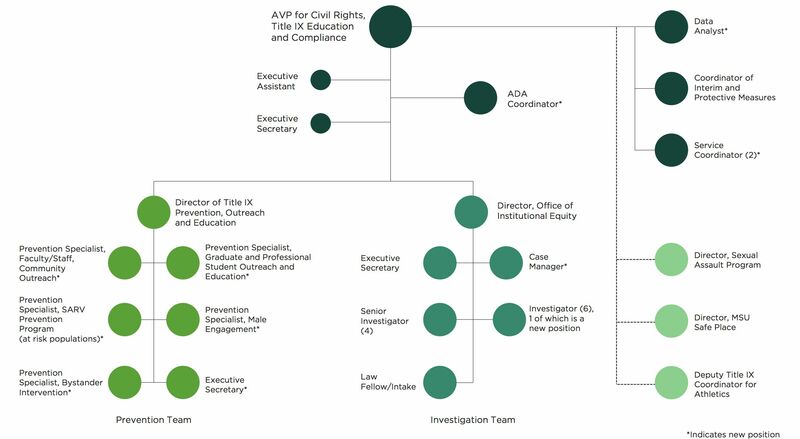 According to the following chart depicting the office's new positions, it is not evident that mental health professionals will be added to the staff. The new positions do, however, include additional investigators, a case manager and service coordinators to assist in the investigation process and help provide access to support services. Follow this story for further updates and details.